On the evening of January 31, 2014, coordinated by the Wine Library Associates of Sonoma County, the Atlantic Seaboard Wine Association (ASWA) presented a wine tasting in Healdsburg, California. 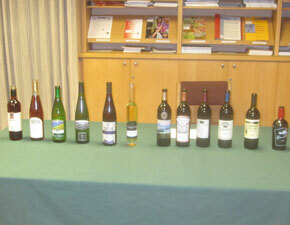 The event was titled “Non-Vinifera Wines of the East” and featured Dave Barber, Vice President of ASWA. 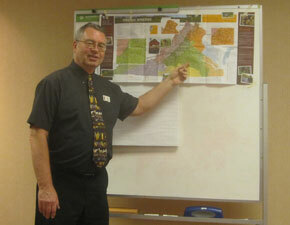 Mr. Barber began the evening by explaining the differences in the east between the geographical growing areas. After discussing the specific locations for some of the hybrids and native American varieties, he went on to focus on the wines he had selected for the presentation this evening. Mr. Barber then led the forty-plus attendees through a tasting of six pre-poured wines selected to present typical attributes of their specific varietals. At the completion of ASWA Vice President, David Barber’s presentation the attendees were invited to taste 24 individual award winning wines from the 9th annual Atlantic Seaboard Wine Association wine competition which is held very year in Haymarket, VA in July. This photo shows one of the two tasting stations with wines for the attendees to enjoy. 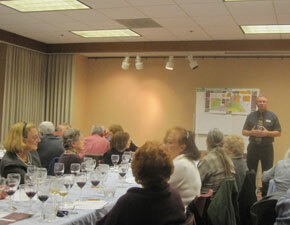 ASWA Vice President, David Barber, making his presentation on “Non-Vinifera Wines of the East” to the group at the Sonoma County Wine Library in Healdsburg, CA on 31 January 2014. The group included writers, winery tasting room staff, wine-makers , culinary workers and wine lovers. The Sonoma County Wine Library presentation room in Healdsburg, CA where ASWA Vice President, David Barber made his presentation ” Non-Vinfera Wines of the East “. 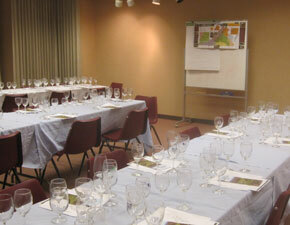 The room was set up for forty plus people and the wines were-pre-poured. It was a sell-out affair. It is the fourth year that ASWA has made a presentation on atlantic seaboard wines to members of the Sonoma County Wine Library Association. ASWA Vice President, David Barber presenting ” Non-Vinifera Wines of the East” using a 2014 map of Virginia wineries published by the Virginia Wine Board Marketing Office in Richmond, VA to point out specific areas in Virginia where non-vinifera grapes are grown and wine made. After the formal presentation and discussion of the six wines, the attendees were then invited to graze on some specially prepared hors d’oeuvres and taste some twenty-four additional east coast wines opened for the evening.